Originally designed to preserve the fisherman's catch in the days when refrigeration was not an option, this dish tastes so good that it has remained on the Mediterranean menu ever since. Rinse the sardines in a collander and shake dry - they should remain a little damp. Spread the flour, mixed with the salt, on a plate. Coat the fish lightly in the flour. Heat 2 tbsp of the olive oil gently in a frying pan. 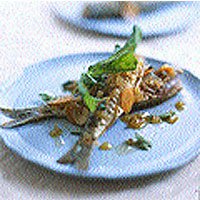 Lay a single layer of sardines in the oil and fry for 2-3 minutes a side - longer if the fish are very plump. As soon as they're lightly browned, transfer to a shallow dish. Continue until all are cooked. Wipe the pan and heat the remaining oil gently. Add the remaining ingredients, in the order listed, cooking gently without letting anything brown. When they are all incorporated, increase the heat and bubble fiercely for a minute or two. Add 2 tbsp of water, then pour the aromatic liquid over the fish. Cover loosely with a clean cloth, cool and leave overnight in teh fridge. The following morning, turn the fish in the marinade. They will be ready to eat in a day, good in two, better in three. Serve with sliced tomatoes and a salad of bitter leaves. This recipe was first published in June 2001.